Thank you for your interest in our SA Water Case Study. To download please complete and submit the form. 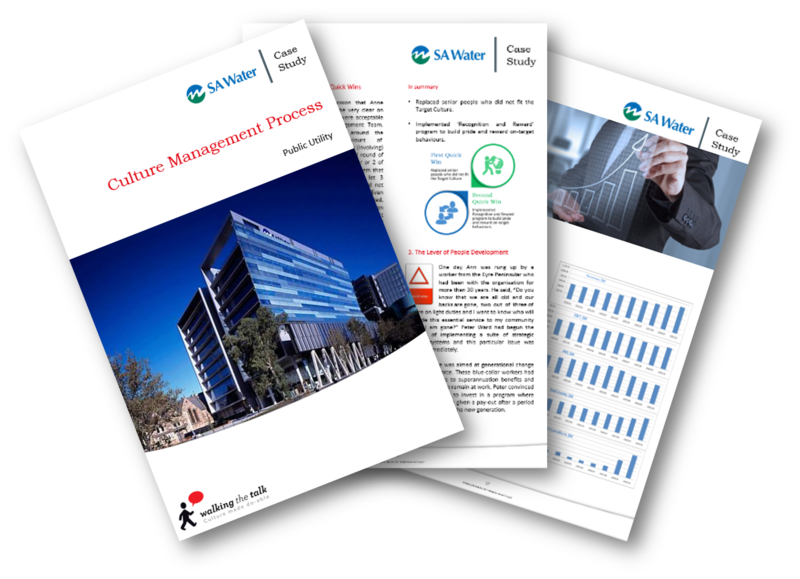 This case study follows the cultural management process of SA Water Corporation, a public utility company in the Australian state of South Australia, for the decade 2000 to 2010. It is a journey that saw SA Water transform from a department of the public service to a strong and vibrant business focused on sustainability. The Walking the Talk methodologies and tools were introduced to SA Water in the early stages of the journey and have been integral to this transition. This case study follows the methodologies adopted and the tools deployed, analysing in what order and to what effect? We hope some of their experience will help you develop and maintain your Culture Plan and actions.